In “Signs & Symbols”, a series of twelve mosaics, each work features a symbol that conveys information set within a background intended to evoke context. The Greek Key, featured in this mosaic, is said to have originally symbolized a “safe return home”. In fact, this design was found on a Greek plate dating to 500 BC that commemorates the deeds of Jason and his safe return home. 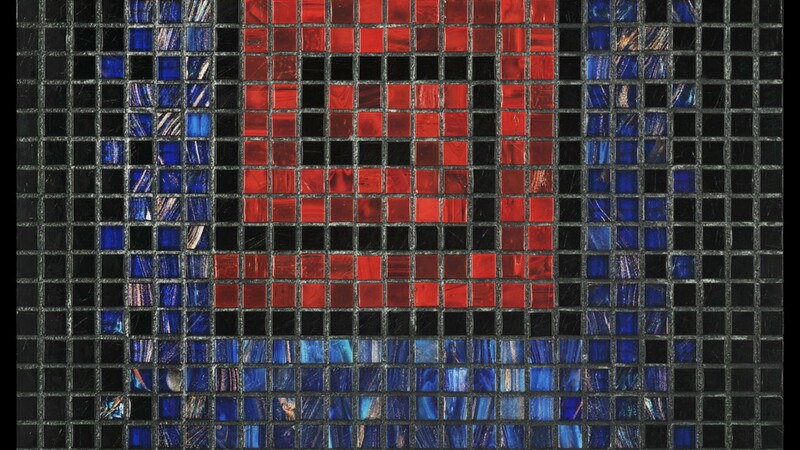 In this mosaic, the color red represents the life force of the adventurers and blue is the sea upon which they sailed home. While this symbol is strongly associated with the Greeks, variations on the Greek Key design may be found on Egyptian tombs, ancient Chinese buildings and sculptures, and in Mayan carvings and textiles. It is the Greeks, however, who used the motif so exuberantly on buildings, floors, ceilings, textiles, and pottery. This design was adopted by the Romans and ultimately made it’s way to Europe and is now found throughout the world on buildings, in homes and on articles of clothing. Symbols have been used as a means of disseminating information for at least 5,000 years.The concept of communicating across the centuries and around the world fills me with a sense of wonder. Ancient humans found a way to convey information and ideas to distant others. It is an achievement I honor in this series.